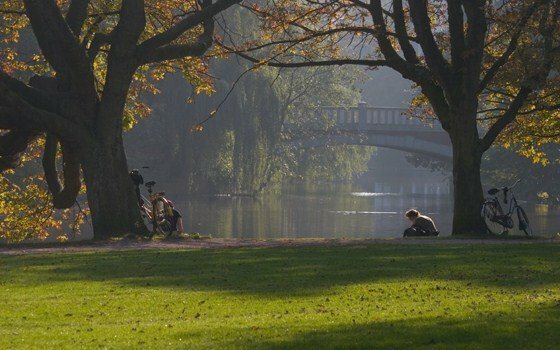 Attracting 10 million visitors per year, the Vondelpark is Amsterdam’s largest – and most famous – municipal park. The lush 45-hectare site includes a famous open-air theatre, numerous children’s playgrounds and several cafés and restaurants, making it a thriving hub of activity in any season. Unsurprisingly, it’s beloved by visitors and locals alike. The Vondelpark is the largest city park in Amsterdam. Visit the famous open-air theatre which hosts music, theatre and dance performances from May to September. The Vondelpark opened in 1865 as a fashionable leisure spot for Amsterdam’s middle class, designed by landscape architect Jan David Zocher. It was originally titled ‘Nieuwe Park’ (literally ‘New Park’), although it was officially renamed to Vondelpark in 1880, after the statue of 17th-century Dutch poet Joost van den Vondel, which had been unveiled in the park some 13 years earlier. Zocher designed the Vondelpark in the popular English landscape style, creating rolling vistas of pathways, lakes and woods to give the illusion of an idealised natural landscape. The park continued to expand throughout the later decades of the 19th century, with the bandstand and the Pavilion building constructed in the 1870s. The park was donated to the city of Amsterdam in 1953. The park is home to several popular café bars, including the picturesque Groot Melkhuis (‘Large Milkhouse’) with its waterside terrace, the 1930s modernist Blauwe Teehuis (‘Blue Tea House’) which resembles a giant flying saucer, and the popular summertime spot Vondeltuin, complete with its whimsical beer garden. The grand 19th-century Pavilion, located in the northwestern corner of the park, was even home to the city’s Film Museum from 1975 until 2011 when it moved to the EYE Amsterdam building in the north of the city. Now the iconic Pavilion building houses elegant restaurant Vondelpark3. The Vondelpark plays host to many sporting and cultural events throughout the year. From May to September its famous Open-Air Theatre offers a free programme of cabaret, theatre, live music and comedy, while every Friday night the park is the meeting point for Amsterdam institution the Friday Night Skate – simply show up with your roller skates and head out into the city as a group. The national holiday on King’s Day sees the Vondelpark transformed into a giant open-air children’s market, with Amsterdam’s youngsters turning out in droves to sell their unwanted toys and clothes, or to busk with musical instruments. The Vondelpark is centrally located in Amsterdam, bordered by the vibrant nightlife hotspot Leidseplein to the north and the cultural hub of Museumplein to the south. Combine a visit to the Vondelpark with a trip to Holland’s most famous museum: the Rijksmuseum. Many of the large mansion houses in the neighbouring Oud-Zuid district were converted into hotels, so it’s possible to stay right on the Vondelpark’s doorstep and experience life like a member of Amsterdam’s 19th-century gentility.